Jesus, the owner at JUMA Investigations, contacted us early yesterday morning expressing his need to have a basic website built for his private investigations business. He provided us a few samples of some different websites in his field. Once we understood his request, we got to work right away on his website once the payment was received. We worked diligently with Jesus in the evening to get his website mostly completed – all within just four hours of the initial payment being done. Today, a few final items were added and changed on the website and he was pleased with the end result! He has also asked us about graphic design services, so he may have us create a few graphics for him in the future. Thank you for the ability to create a small business website design for your investigations business, Jesus! 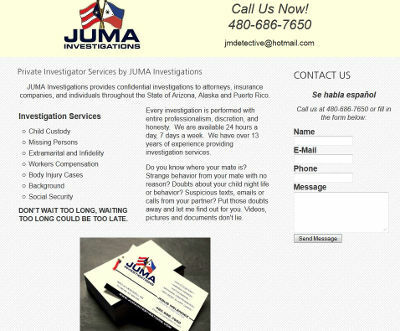 JUMA Investigations website is jumainvestigations.com.